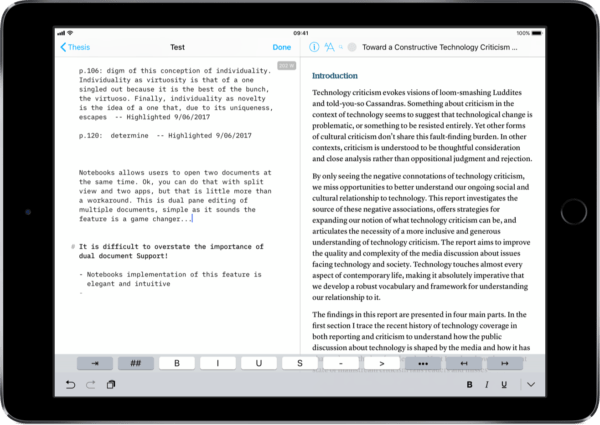 For as long as the iPad has been an excellent device for focused writing, it has never been good for citations and referencing. 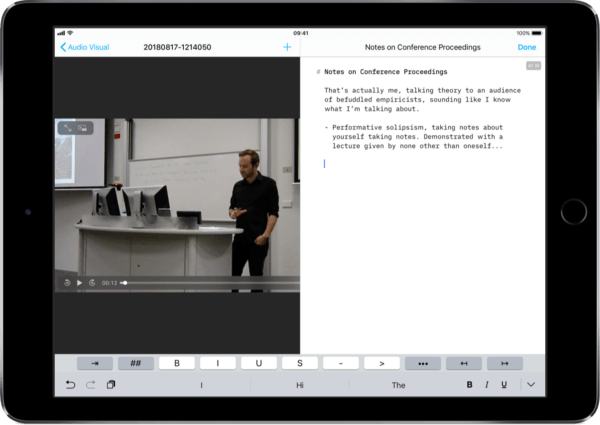 Referencing on iPad remains the final, stubborn piece of the puzzle to fully untether iOS from the Mac for academic writing. 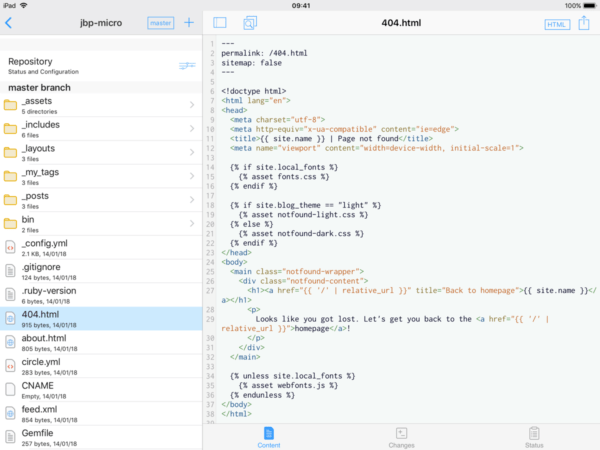 It appears, without exception, the iOS is not yet viewed by developers of referencing software as a fully fledged computing platform. That leaves us with a choice between poorly designed companion apps, or hacking together a solution of our own. 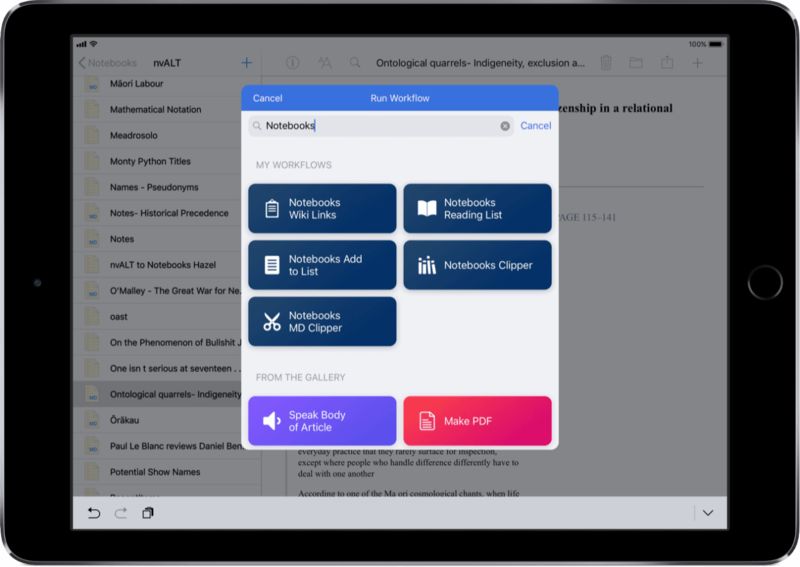 I have opted for the latter, by configuring different workflows using Apple’s Shortcuts app and the excellent Zotero API. 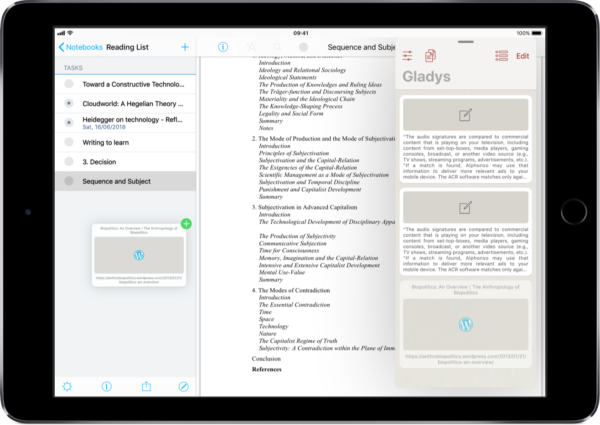 What follows is not a primer on referencing, rather it is a means for managing citations on iPad, or even iPhone in a pinch. 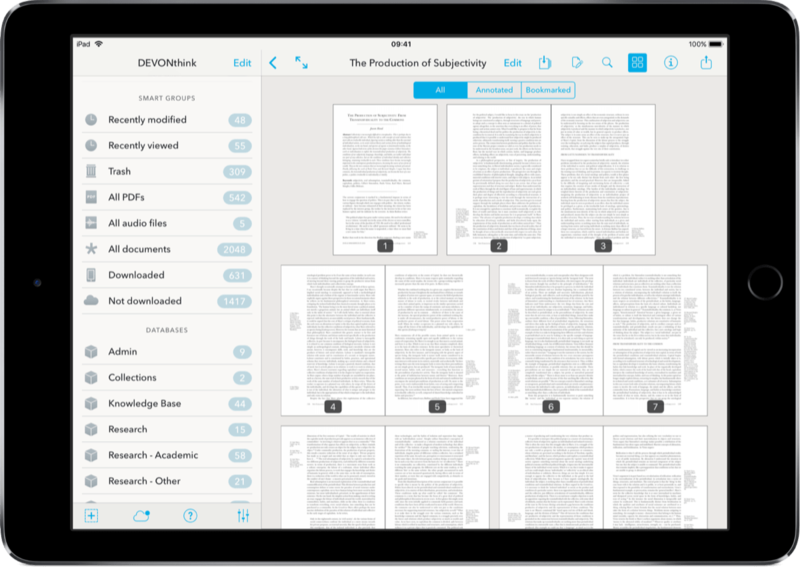 It assumes some knowledge of Zotero, but that is not difficult to acquire. 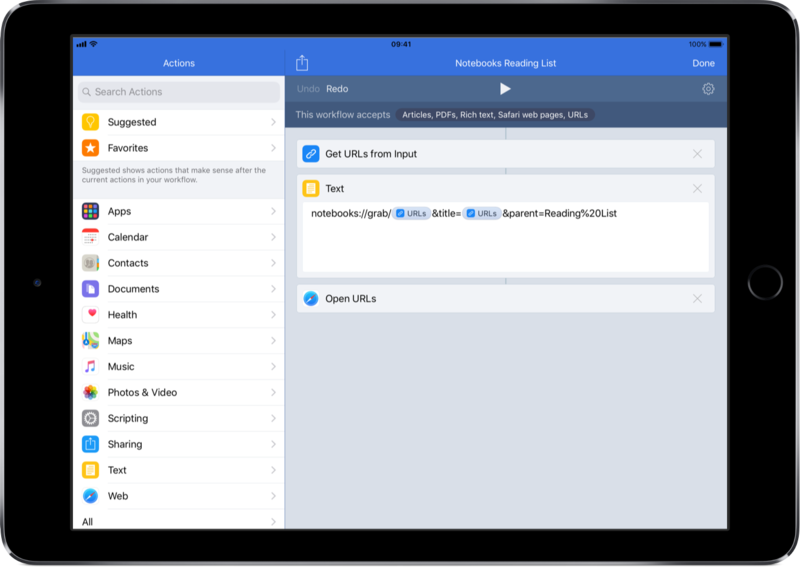 These tips will be useful regardless of whether you work with both macOS and iOS, or do everything on an iPad. 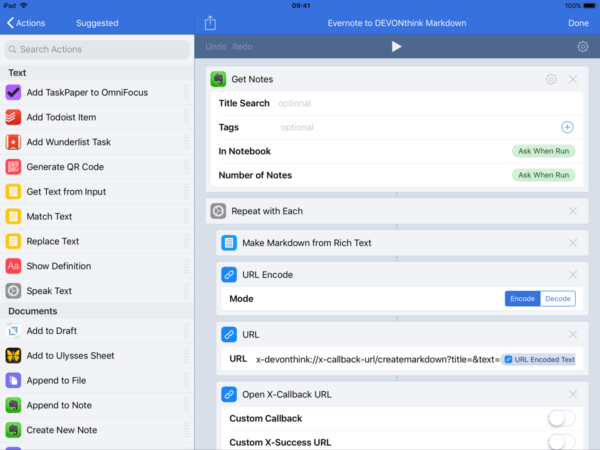 With a little help from iOS Shortcuts, referencing on iPad is that little bit less painful. There are different ways to come at this. The method you choose will depend on a few variables. 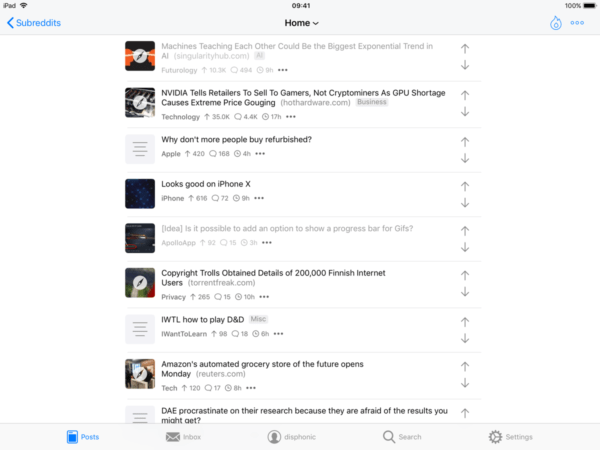 The biggest distinction is likely to be whether you work iOS only, or you also operate a Mac. 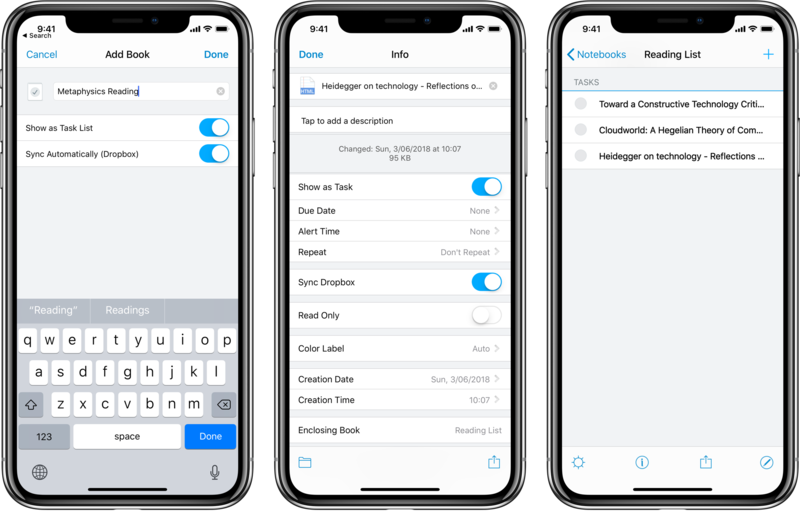 However, there is also a question of how complex your work is, and whether or not you want to automate the process entirely, or you’re happy to manage a few aspects manually. 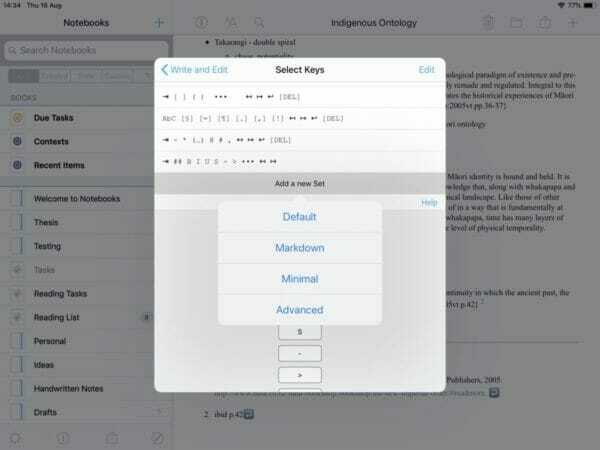 If you are looking for the more comprehensive option, see the section below on rendering a bibliography. 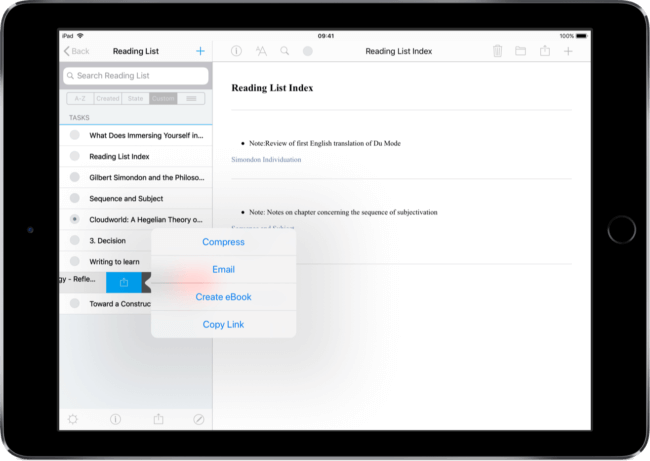 See below for how to automate the creation of your reference list. 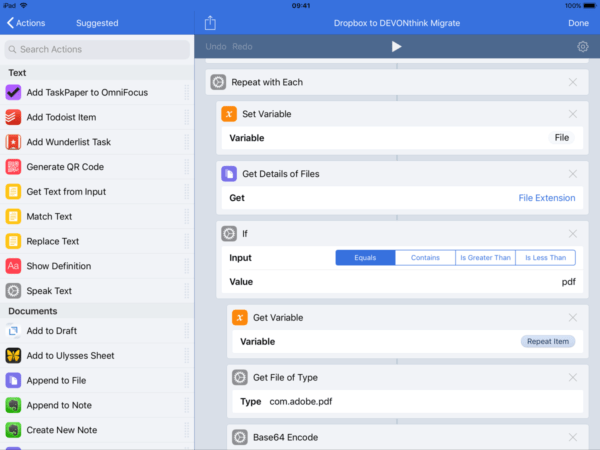 You can download a workflow for either here. Depending on the complexity of your needs, this is where it can get tricky. 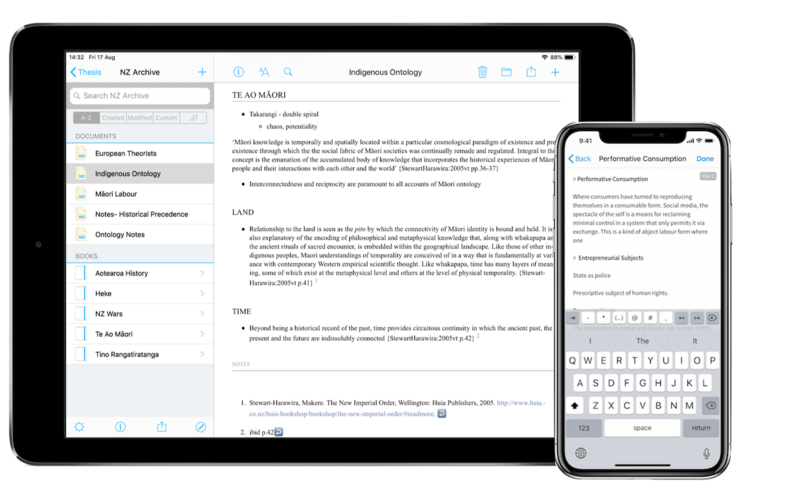 If you're writing anything genuinely long form — a dissertation, thesis, or a book — then this is the last remaining task where it is useful to have access to a Mac, or PC if necessary. That doesn’t mean you need to own one. 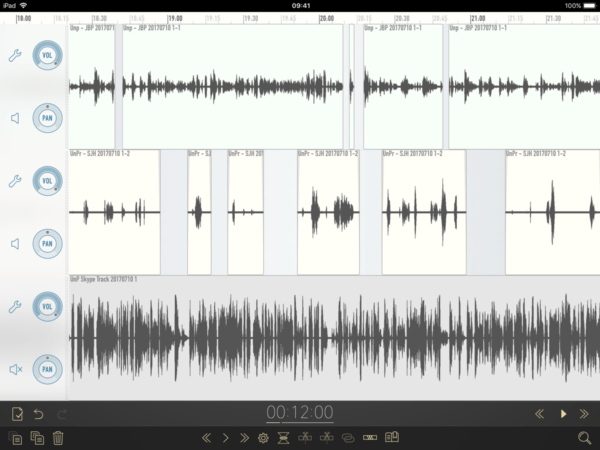 Workarounds exist to make this possible from an iPad. 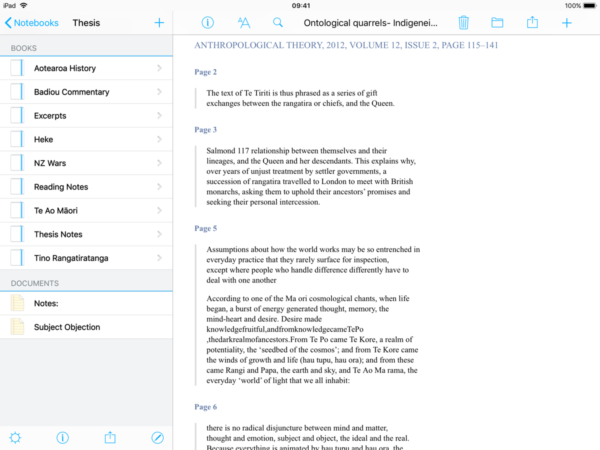 For the most simple version of this, Zotero can produce a bibliography online, but it’s not pretty. 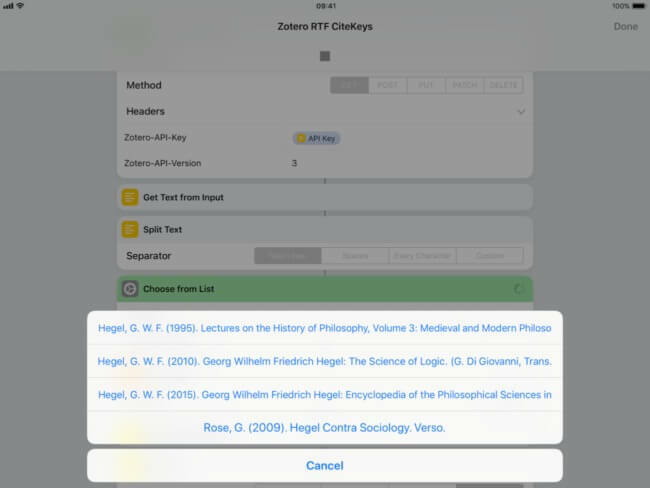 Fortunately, Shortcuts can retrieve a formatted reference list from the Zotero API. 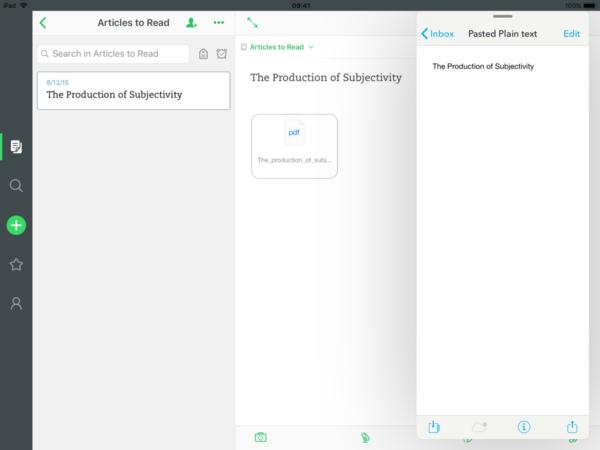 If you want to use the Cite as You Write shortcut from above, you can retrieve the reference list, or bibliography from the relevant collection with the following shortcut. 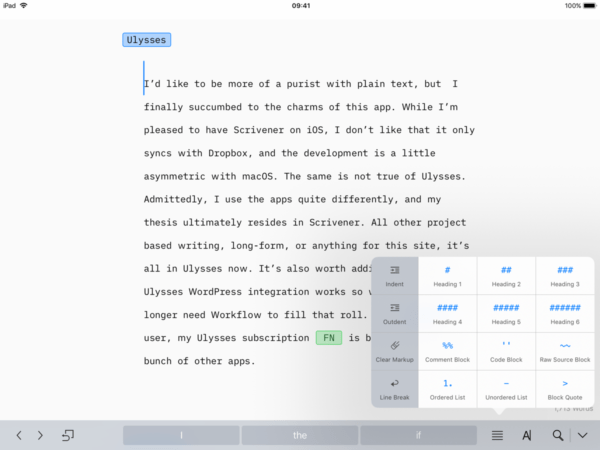 Note, these workflows don’t know what references are in your document, there is no way to automate that via Shortcuts. They are by no means perfect, so proof your work carefully. If you cannot access a desktop directly, there is always Amazon Workstations. It’s free to set one up, and you’ll only need it briefly. Be careful to choose an option available on the free tier though, or you could be in for an unpleasant surprise when a bill arrives. 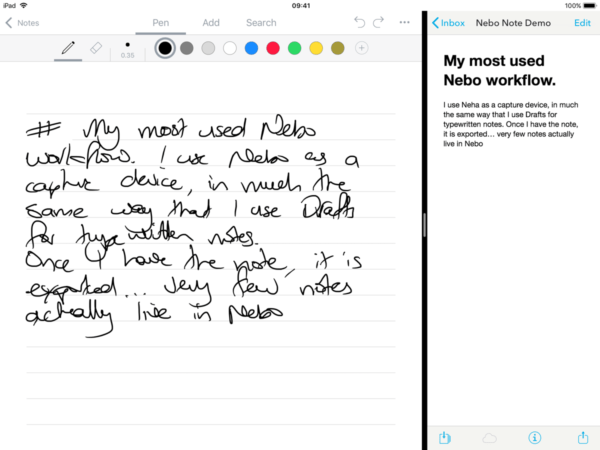 The iPad app for Amazon Workstations is useable enough for this. 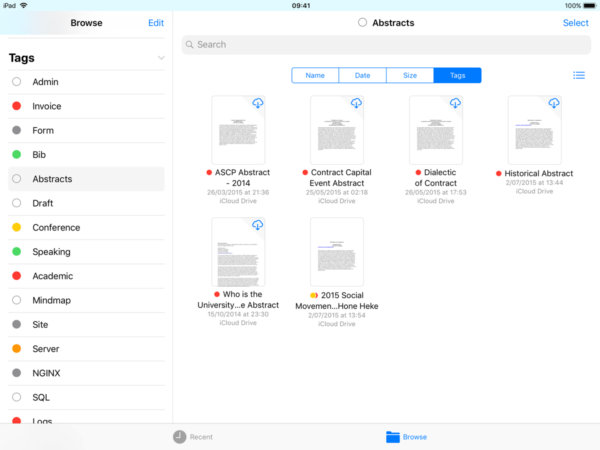 You can manage your referencing on iPad with Zotero, then setup a workstation to run the finished project through the scanner. Often on campus it is easy enough to access a desktop, but installing software can be a problem. 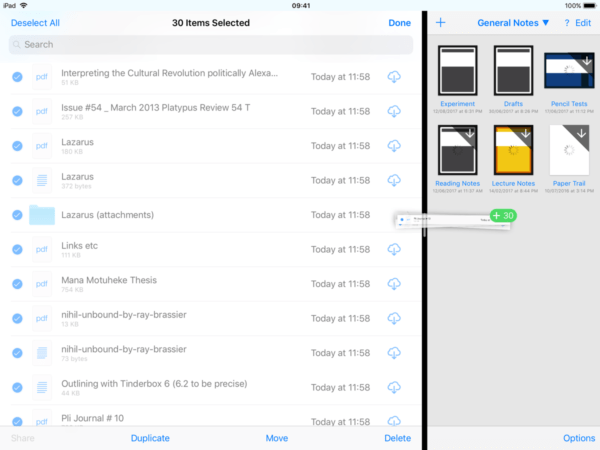 For that situation, the unofficial Portable Apps version of Zotero should do the trick. Install it on a portable drive and run it on demand. To be honest, I like this option more than using AWS. 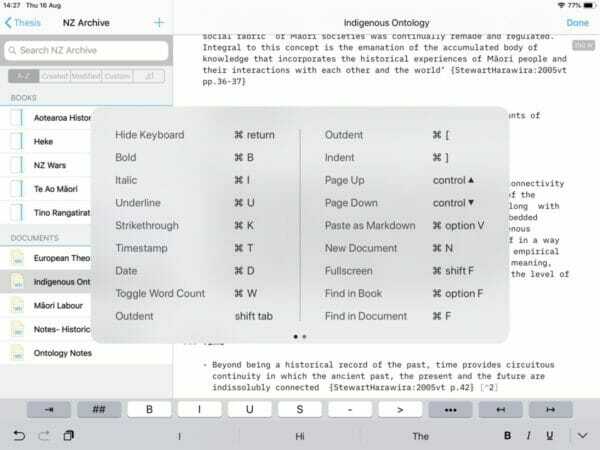 Zotero’s Web API with the Shortcuts app is presently ās good as it gets for referencing on iPad. 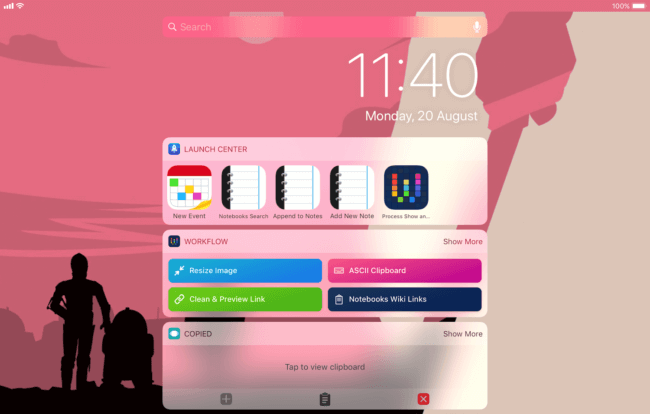 I’m not exaggerating when I say I have tried everything else, nothing comes close where iOS is concerned. 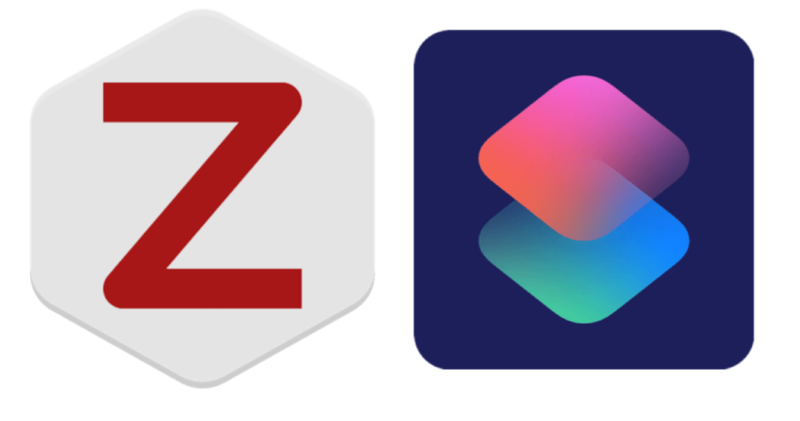 From its communal, open source development, to its stance on privacy, Zotero is an antidote to the proprietary systems of giant academic publishers. 5 I cannot speak highly enough of the Zotero service. If you can spring for it, I recommend upgrading the storage option for both the utility, and to support their work. US$20 will buy you 2GB for a year, which is plenty for PDF documents. 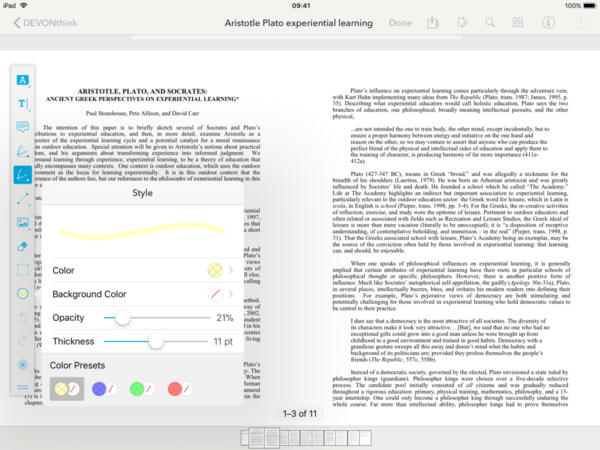 For Mac users, Zotero is not the only solution I can recommend. 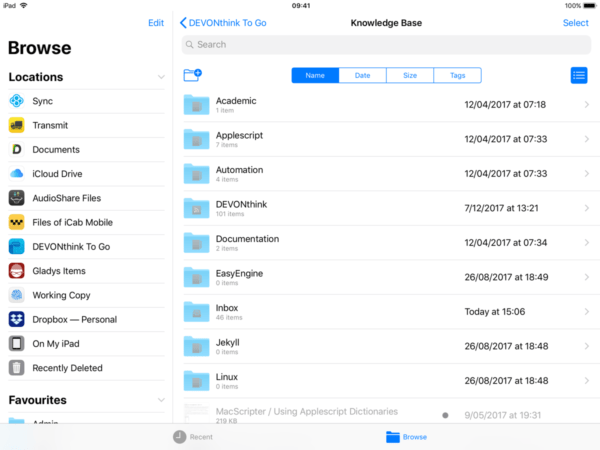 I have started testing the native macOS referencing solution, Bookends, recently. I can tell you, it is impressive. 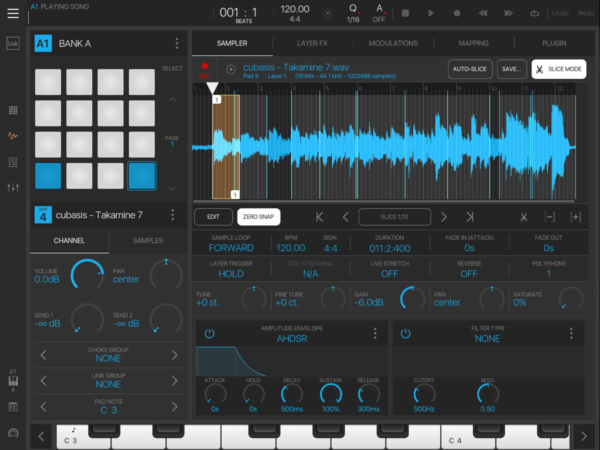 I will post a proper review at some point, but there is a free trial available. 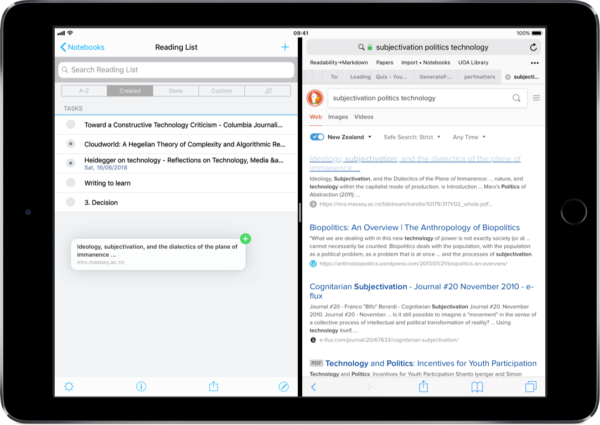 Both these solutions, Zotero and Bookends, offer and excellent alternative to EndNote, Mendely, and the other big commercial referencing solutions. 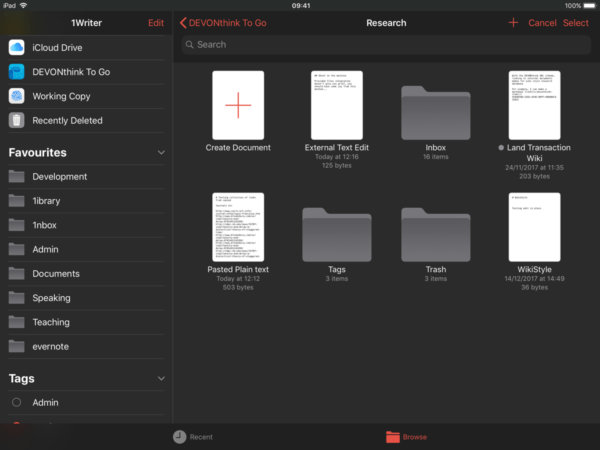 But at this point, for academic writing on iOS, Zotero is the best option we have currently. 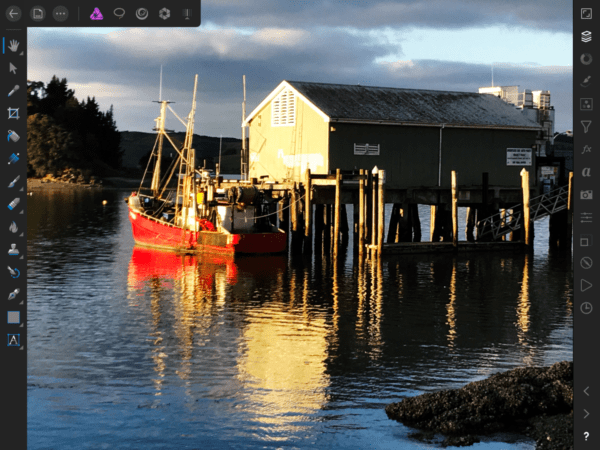 Whether you use these workflows, or shortcuts as they are or adapt them to your needs, I hope you find them useful. If you need any help configuring them, don't be afraid to contact me via one of the methods to your left. 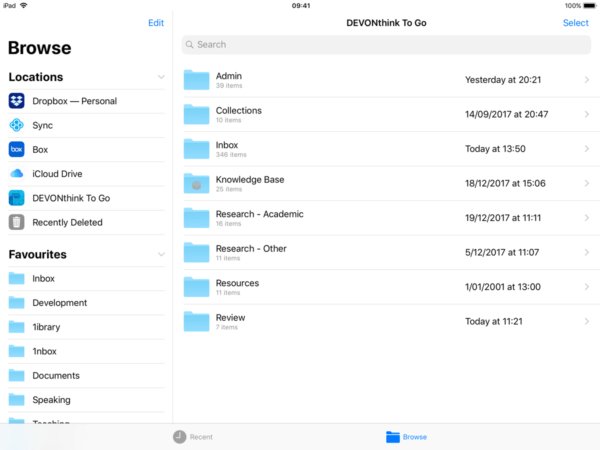 DEVONthink To Go is DEVON technologies' document and information management solution for iOS. 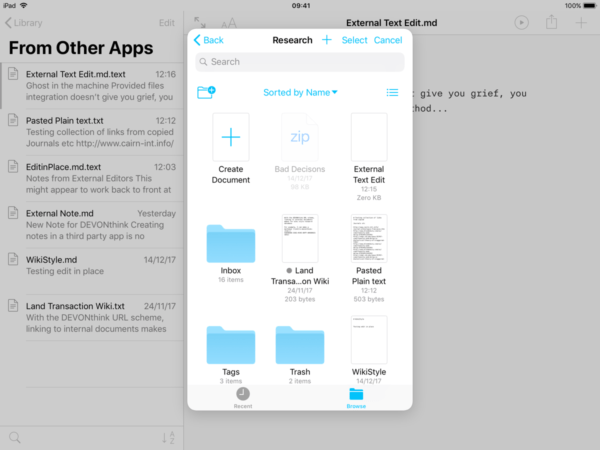 Serving as repository for a large variety of data types it lets users keep their important documents with them at all times. 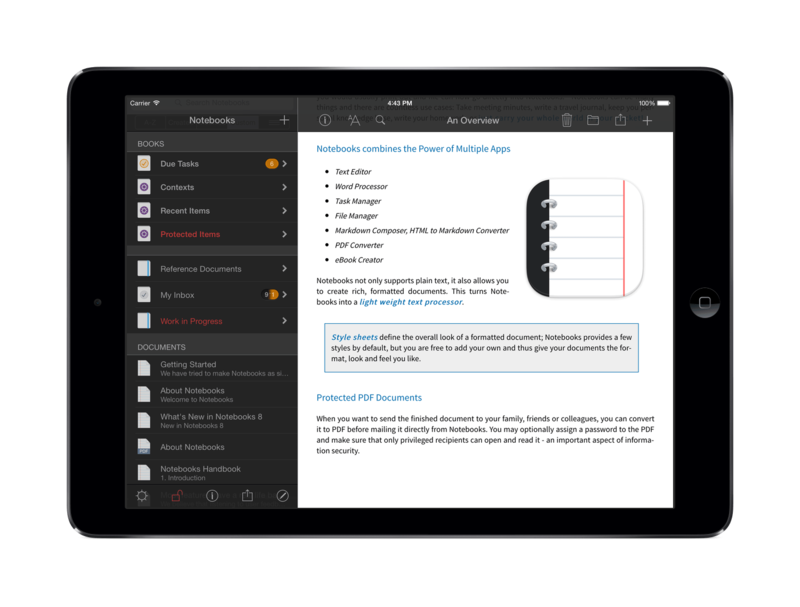 It offers a rich set of organizing features as well as built-in viewers and editors for many file formats. 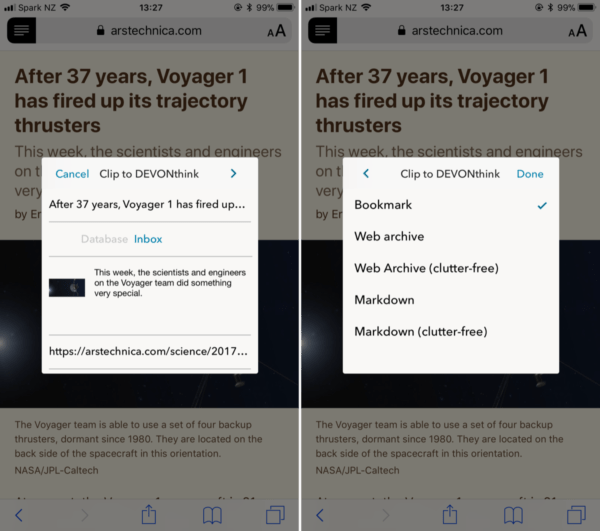 Document provider and file provider extensions make documents available in other apps, and an encrypted synchronization keeps all data in sync with other iOS devices as well as with its Mac counterpart, DEVONthink, without compromizing the user's privacy. Apart from the obligatory iPhone X support. 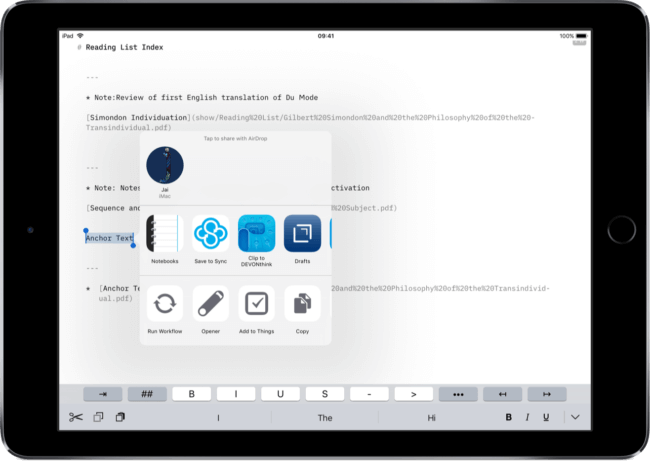 This update includes further improvements to File App integration, smarter PDF interactions and markup, new document editing capabilities for table data., and refinements to database syncing. 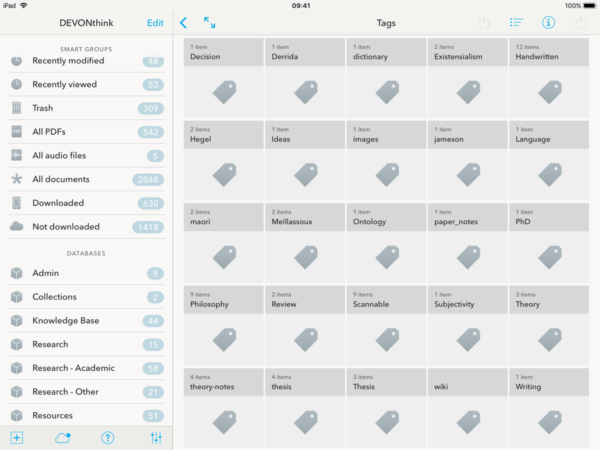 Effectively using DEVONthink apps is a huge topic, given what you can do with them. 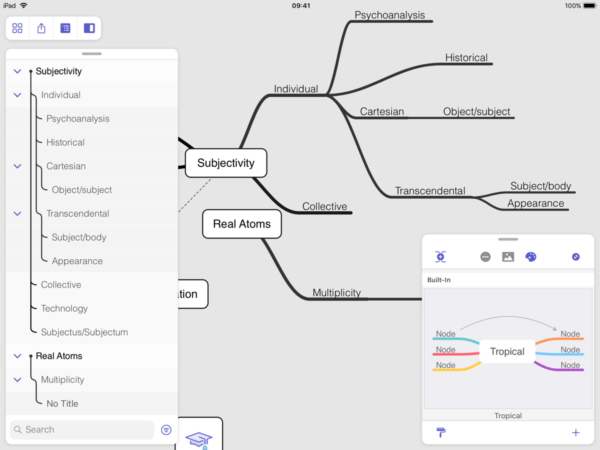 I have every intention of a deep dive on DEVONthink, when I can do it the justice it deserves. It is tidbits for the meantime. 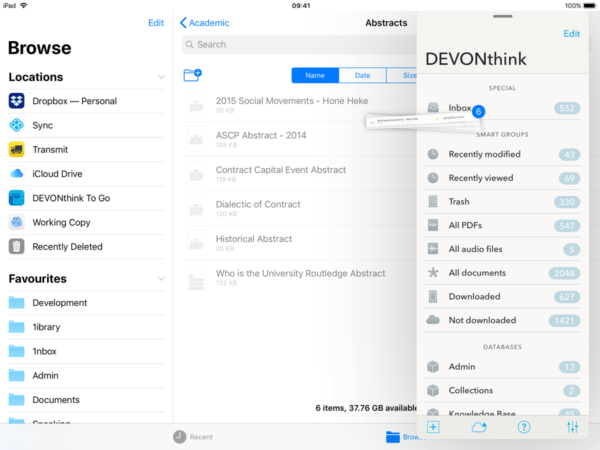 For users of DEVONthink on macOS, DEVONthink to Go is an ideal companion app. 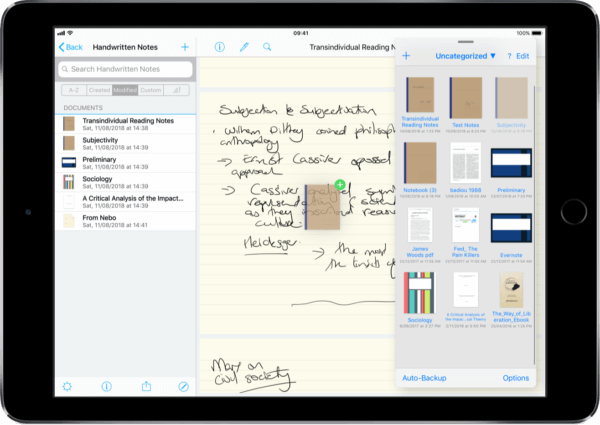 On its own merits, it is also an excellent self-contained solution for iPad first, or iOS only users. 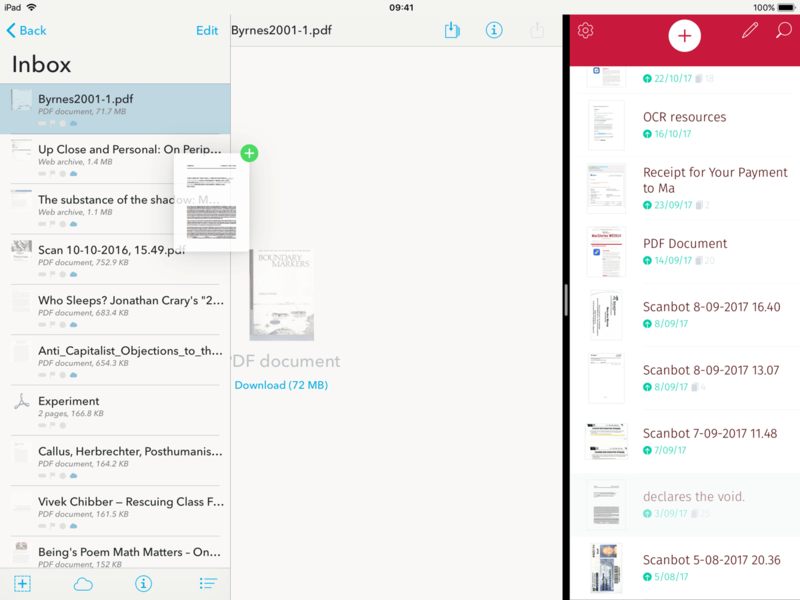 Now with drag and drop on iOS 11, OCR integration with third-party apps like Scanbot is much easier. 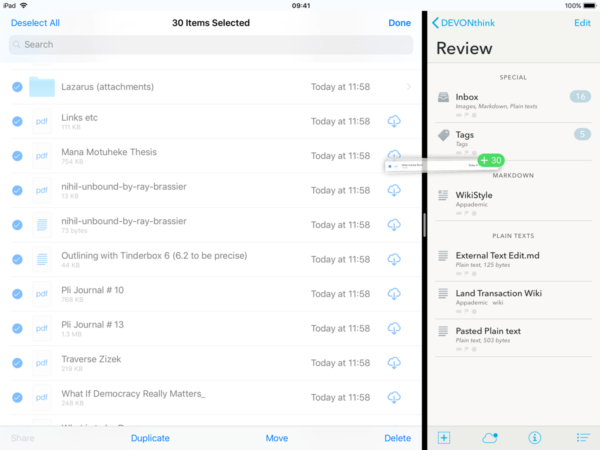 The excellent native x-callback-url support also makes DEVONthink to Go one of the best apps you will find for Workflow automation. 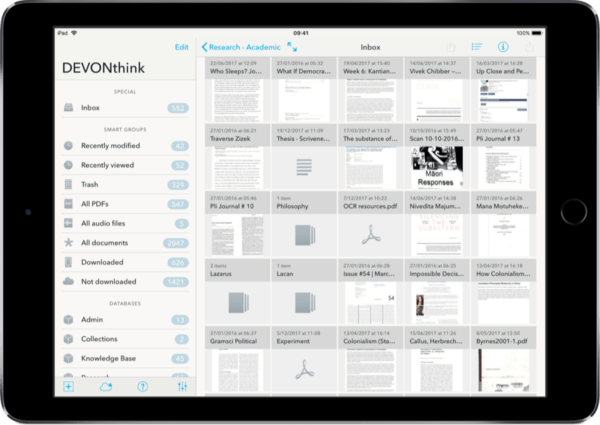 All in all, you can set up a robust research system on iOS using DEVONthink. 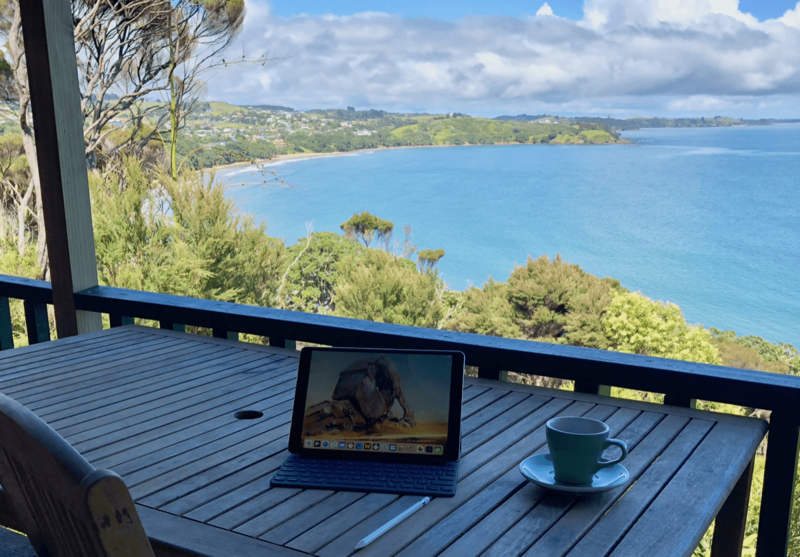 With, or without a Mac.